Usually, when you start on dialysis you will be admitted to hospital. Most people have 3 sessions over a three-day period, starting with a twohour session; this is increased at the next session to two and a half hours and then 3 hours. This allows your body to get gradually used to the procedure and the toxins are removed slowly. It is normal to feel very anxious at first but do not worry. You will feel less anxious once you are connected to the dialysis machine. Do not be afraid to express your anxieties to your nurse. It is amazing how anxieties can be put to rest by discussing your concerns. monitor. This is routine for all new patients. Generally speaking, the dialyser is essentially a filter. 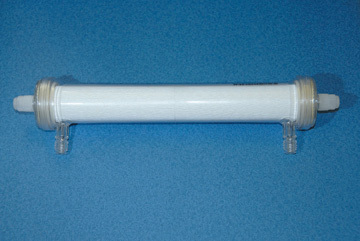 It is a cylinder that contains very thin plastic fibres that act as a dialysis membrane. 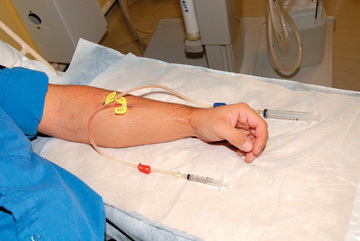 Your blood runs along the middle of the fibres and the dialysis fluid is pumped on the outside of the fibres. There is no contact between the blood and the dialysis fluid. In the dialyser, toxins and excess water (which are the equivalent of the urine produced by the healthy kidneys) pass from the blood into the dialysis fluid (dialysate). The cleansed blood is then returned to the body at the same rate at which it is removed; approximately 200-300mls per minute. In the dialyser the blood flows along one side of a semipermeable membrane made of cellulose or a similar product, with the dialysate flowing on the other side. The different molecules pass through the dialyser, at different rates, until a suitable concentration is achieved. Urea and electrolyte and calcium and phosphate levels. Dry weight is the weight that you are with no excess fluid accumulated in the body. 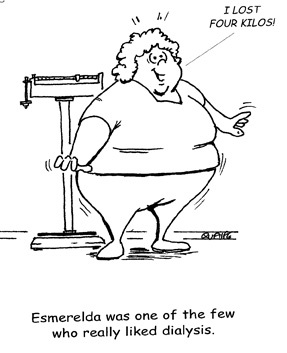 Your weight may drop if you have been unwell or not eating. It can also rise if you have had an increase in appetite and gained body weight. Before and after your dialysis treatment you will be weighed. This monitoring of your pre- and post-dialysis weight allows the nurse to calculate how much fluid needs to be removed from your body. During dialysis the fluid you accumulate between dialysis sessions is called the intradialytic weight gain. For example: If you gain 1kg of weight we would aim to remove 1.5 litres of fluid. This is because 1kg of weight gain is equal to 1 litre of fluid. The extra 0.5 litre is to account for the fluid you receive during your treatment. Your dry weight will be adjusted regularly, based on how much you are eating, your blood pressure and if there is swelling (fluid) on your ankles. One of the most important means of controlling your blood pressure, when you are on dialysis, is by adjusting your dry weight. If your blood pressure rises, your doctor may advise that you have your dry weight reduced. If you are feeling dizzy and light-headed after dialysis or having cramps, your doctor may increase your dry weight. The amount of fluid to be removed is individualised, and depends on how you are feeling, the amount of urine you may pass, your blood pressure and how much fluid removal you can tolerate. Each person can tolerate different amounts, depending on a number of different factors. It might be useful to measure the cup/glass that you use at home, and this will help you to limit your fluid intake as discussed with your team. It is important that you adhere to the advice given by your dietitian and limit the intake of fluids. What Happens When You Arrive For Dialysis? 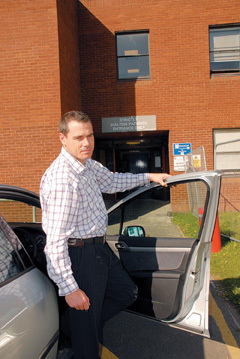 The dialysis unit will arrange transport to the unit, if you require. This may be either by minibus or taxi. When you come into the dialysis unit you will meet your nurse, who will discuss with you any difficulties since your last treatment. All patients have a medical file which is kept up-to-date with all relevant information. When you arrive, for dialysis, ensure you empty your bladder if you still have a urine output. You will be asked or helped to weigh yourself. It is important to wash your hands prior to starting your treatment, after which you will sit in a dialysis chair/bed, according to your preference, in order to receive your treatment. The nurse will carefully clean your dialysis access: the skin, if you have a fistula, or the end of your permcath. If you have a fistula, two needles will becarefully inserted which is necessary to connect you to the dialysis machine. As the blood pump starts, you will see your blood going into the machine and then returning to you. The dialysis process will take 3 or 4 hours. During this time you should relax, read a book, or watch television. Throughout the dialysis treatment, you will be monitored closely: Your blood pressure and pulse being measured frequently. If you feel weak, you should let your nurse know straight away as this can be quickly corrected by giving you some extra fluids. When the dialysis treatment is complete, your dialysis needles will be removed and pressure applied to the sites until the bleeding stops, or your dialysis catheter will be redressed. It is important not to jump up or stand up quickly, after your treatment, as some patients’ blood pressure can drop and can cause them to feel dizzy. You will then be weighed again to determine how much fluid has been removed during the treatment. It is advisable to stay in the dialysis unit for a short period before you go home. After each use the dialysis machine is carefully chemically disinfected to prevent any transmission of blood borne infections between patients. Once you have settled into a dialysis pattern that is right for you, you will be given a fixed schedule of treatment times. Most patients have dialysis three times a week, every second day, Monday, Wednesday, Friday or Tuesday, Thursday and Saturday. When you are discharged, every effort will be made to ensure that you will be given dialysis times that suit your needs. However, staff may have to change your times based on the physical needs of other patients. If you need to change times, for a special occasion, please ask the nurse manager who will try and facilitate you. Once you have commenced haemodialysis, you will be allocated a specific time and day for your dialysis treatment. This is normally a fixed appointment, although the hospital can change the times and days, either as a one-off for a specific reason, or if the allocated time does not suit you. 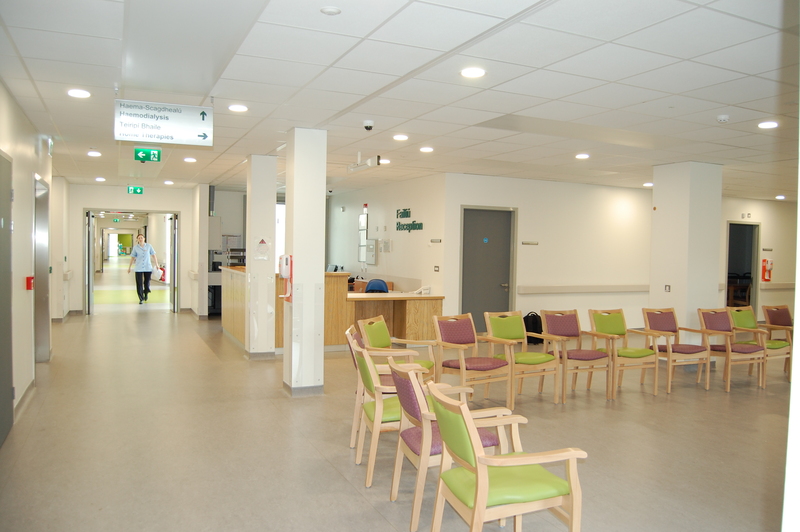 Within Beaumont Hospital, two units provide haemodialysis. Dialysis Therapies Centre , on the 1st floor of Aislin Centre has two unit (DTC Unit 1 & Unit 2) and St. Peter’s on the fourth floor. We also supervise patients in the Northern Cross Haemodialysis Unit. This is an off-site unit, run by Fresenius Medical Care, who are a large dialysis provider. Northern Cross provides the same dialysis treatment as Beaumont Hospital, under the supervision of the Consultants from Beaumont Hospital. 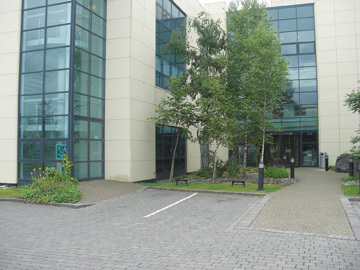 Dietetic and counselling services are also provided to Northern Cross patients from Beaumont Hospital staff. You may discuss your dialysis unit preference with your doctor or Patient Care Co-ordinators. They will do their best to accommodate your requirements.